Generally speaking, American vehicles are adequate in most roles, and they are generally "Jack Of All Trades" but lack a specialization. However, they tend to perform well hull down, have good view range, and have good terrain resistance. American guns rarely have stellar penetration values, accuracy, or damage per shell for their tier, instead preferring rapid reload times. In miscellany, American vehicles tend to be larger than their counterparts, and tend to share many components such as guns, radios and engines, making research for multiple lines easy. They are a fairly easy-to-play and an easily understandable nation in comparison with other nations, but hard to master and use them to their full potential. American light tanks tanks tend to be more adaptable in combat situations than other lights, and at higher tiers can fulfill the roles of scout and flanker very well. Their most notable feature is their good view ranges, top speeds (in the Chaffee line), and high rate of fire (which can help in a brawl). American lights are relatively large targets and can lack in armour. The line splits into two at tier 5. American medium tanks are perfect for adaptive strategies and they are generally and more commonly referred to as "Jack Of All Trades". They are able to both move quickly, do spotting, and take some damage. As well as this, they can deliver the firepower when needed and have decent accuracy on the move — combined with gun depression and decent turret armor, this makes them rather survivable while hull-down and comfortable to play. American mediums boast above average view range with some being best in their tiers. American mediums tend to play the role of support tanks more often compared to other mediums, but are perfectly capable of operating on their own merits as well. When in a platoon of other American medium tanks of the same tier, it can engage and destroy the toughest of targets. American heavy tanks have generally light hull armor all-round (Until Tier 9) but always have a few areas of extreme thickness, mainly in the front turret. 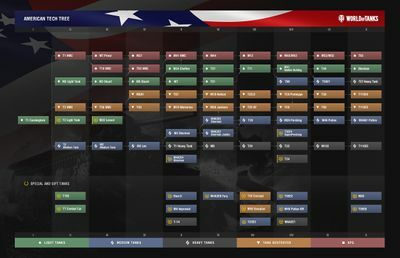 At Tier 9 The American Heavy tank change from having Light Hull Armor to a more heavily armored variant and has an "Eggshell Type" Hull which usually offers greater protection compared to it's predecessors/ They have excellent gun depression and from tier 7, are ideal for hull-down tactics. Often they carry guns that are more balanced than comparable heavy tanks and have good power-to-weight ratios. Good commanders position their tank to hide the weak spots and force the enemy to fire at the strongest points of the armor. American heavies exploit their versatility to avoid certain pitfalls of specialization, and can make use of more varied types of cover than other nations. These are generally defensive or supporting positions, that allow them to use terrain to avoid damage from the front, while at the same time covering their own flanks from fire. American tank destroyers have a variety of playing styles. At low tiers, they are initially mobile with varied and powerful gun selection before eventually splitting into two branches: one with turrets and one mostly without turrets. The turreted TD line remains versatile, exchanging armor for mobility and versatility, before trending more towards heavy tanks with larger guns in the high tiers. The non-turreted line is more specialized, exchanging mobility for armor or vice-versa depending on tier. Both lines are very good for supporting the team by filling very different roles in the battle order. The two american tank destroyer lines often share guns. It can be worthwhile to play both lines simultaneously in order to unlock guns as early as possible. American self propelled guns are all about firepower, splash radius, and wide arcs of gun traversal. They have some of the largest horizontal gun arcs, most noticeable in the M53/55, which allows them to cover large parts of the battlefield without moving the hull. This thereby decreases the need to constantly move their hull and preserves much needed accuracy, an important aspect for American SPGs due to painfully long aim times. The American SPG Line shares a unique feature with the German SPG Line, as the line splits at the T1 GMC and reunites at Tier 5 (M41 HMC). One line (M7 Priest Line) favors gun caliber over accuracy and mobility at Tier 3, and ammo capacity at Tier 4. The T82 Line consists of two ex-Tank Destroyers (the T18 and T82)that were turned into Tier 3 & 4 SPGs, and they favor rate of fire, while having very low damage on the T18, and a relatively low ammo capacity on the T82. The American SPGs also have some of the most powerful guns in the game. The tier 10 T92 eschews and sacrifices tradition, in order to boast the largest gun in the game at 240mm, which comes with a very large splash radius and the potential to one-shot enemy tanks. High-tier US arty has large dispersion, long reloads, and long aim time to compensate for their power. They are able to traverse their hulls acceptably and have decent acceleration and top speed to transport their firepower. This page was last modified on 9 April 2018, at 17:13. This page has been accessed 6,033,713 times.